A network is a community, and for me it’s a foundation that I rely on. I was 19 years old I was working full time and commuting to UTC full time when I found out I was pregnant. I honestly never imagined that it would happen to me, and when it did I didn’t know what to do. I was on my own. I thought I was happy with my life- when in reality I was headed down the wrong path. I was not very religious at the time, but I prayed for an answer. Then when I went to the doctor by myself, and saw her on the ultrasound- I knew. I knew that God gave her to me for a reason, and she was that best gift I could ever ask for. 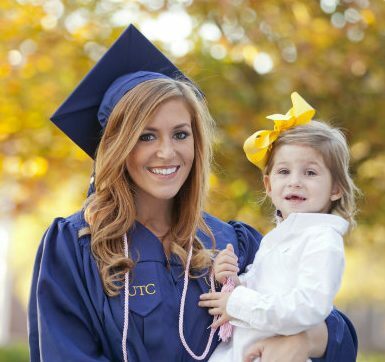 After I had Ava-Katherine I knew that I wanted to create the best life possible for her, and in order to do that I needed to continue my education and return to UTC. When were you introduced to MOMentum, and how? I was introduced to The MOMentum Network in Fall 2015. I was a full time student at UTC and usually only had time to attend class and run out the door to work or take care of Ava-Katherine. Then one day I was studying outside of class, and a girl I had never met (Merilee) came up to me and asked to talk. She said she had overheard me talking about how my toddler broke my phone and I had a lot going on. She then informed me of The MOMentum Network and invited me to attend an event with her. We exchanged numbers and I told her I would let her know, but I thought it was to good to be true. Merilee refused to take no for an answer and continued to reach out to me until I attended an event with her. I immediately felt at home and my life has been different ever since. 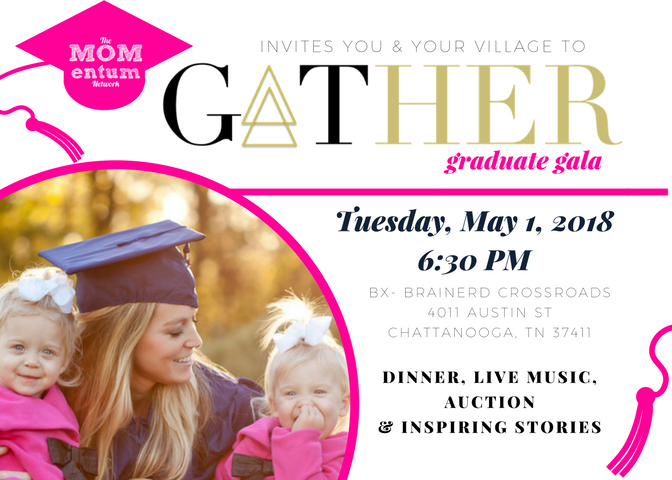 How has MOMentum helped you along your journey as a single mother in college? Before The MOMentum Network, I felt alone. Yes, I had motivation and support from my family and friends- but no one really understood what I felt. After joining this network, I feel relieved. I see and talk to all these other moms that are going through exactly what I am. They are stressed, they are busy, they are single moms just like me. This Network has helped me with my confidence, in knowing that I am able to succeed and there are people that want me to, and want to help me get there. The MOMentum has also helped me to network beyond what I thought I was capable of doing. If you talked to me two years ago, I would never imagine that I would have multiple job offers on the table for after I graduate. It is because of this network and it’s resources, empowering me to step outside of my comfort zone, to introduce myself, and show what I am capable of- that’s what has helped shaped me to become the motivated, determined, college student(almost graduate) that I am today. What does it mean to you to be part of a network? To me being part of a network means teamwork. I feel that what you put into your network is what you will get in return. A network is a community, and for me it’s a foundation that I rely on. I know that if something is to come up and I need help, I can depend on my network and I know that they will always try to help with open arms. What is your advice to other single moms in college? You can do whatever you put your mind to. Do not let the hard times get you down, push through. You are capable of more than you know, and all of your hard work will pay off for a better future for your family. Also, join a network or bible study or both. I never realized how much of a difference it makes to be a part of something. What, if anything, would be different in your life if you hadn’t joined The MOMentum Network? I would not have the faith and confidence that I have today if I had not joined The Momentum Network. This Network has done so much in my life in just the past year, but it has really helped me grow a stronger relationship with God and as a person. I’ve started taking Ava-Katherine and my grandmother back to church. Also, The bible studies with these other moms and women are so motivational and influential, I’m so thankful to be a part of it!